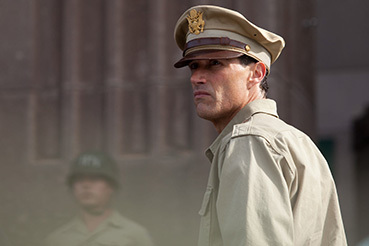 Leading man Matthew Fox talks to Timothy E. RAW about his WWII thriller EMPEROR, on limited UK cinema release now from The Works. Clearly not content to be remembered as the face of one of the most rabidly followed TV series of all time, Matthew Fox is an unlikely A-lister who continues to truly challenge himself as an actor. In a post-Lost career, diversity is the one uniting characteristic of varied and contrasting big screen parts, far removed from the the image of television's Jack Shephard. After playing an angry grunge rocker on stage in Neil LaBute's In a Forest, Dark and Deep and a deranged serial killer in Alex Cross (he's compulsively watchable in an otherwise thoroughly rote thriller), Fox reminds everyone of his old fashioned leading man qualities in the welcomely old fashioned Emperor. A sumptuously shot period procedural, this unexpectedly moving story of love and honour forged between fierce enemies of war is also a deeply resonant historical drama inspired by the true, but little known events of the bold and secret moves that won the peace in the shadows of postwar Japan. In 1945, on behalf of the United States government, General MacArthur (an award-worthy Tommy Lee Jones) finds himself in control of a shell-shocked nation, and maintaining a fragile peace means making a choice between revenge and justice whose consequences will affect a world rebuilding itself from the ruins of war. General Bonner Fellers is the man, who in just a few days, is tasked with ascertaining the truth about the Emperor's role in World War II and the decision to attack Pearl Harbor. Ultimately, Fellers is the one who must decide the Emperor's fate and whether or not he should be put on trial. The future of a nation hangs in the balance of a covert mission which takes him deeper into a disparate culture, whose loyalties and values are alien to his own, all the while having to traverse MacArthur's conflicting loyalties between heart and homeland with larger personal ambitions setting Fellers up as a potential fall guy. In almost every scene of the film, Fox is the eyes, ears and soul of the picture, evincing both intelligence and a romantic sensibility. Facing off against some of Japan's finest actors in a series of terrifically tense and powerfully performed integoration scenes, Fox's delicately attuned reactions to what he's hearing put you right across the table from Japan's political elite. Fellers finds himself swept up not only into a dangerous political game, but into a driven search for the Japanese woman who introduced him to the country's soulful beauty which has haunted his heart ever since. In this the cross-cultural love story, he is reminiscent of the classic romantic leads of the period, and up against Tommy Lee Jones playing a historical icon, he more than holds his own in powerhouse scenes of mutual uncertainty that provide the film's most memorable moments. A remarkable thriller with the highest possible stakes imaginable, this is the type of big screen entertainment Hollywood has seemingly forgotten how to make; a morally centred drama that presents two very different views of the world in 1945, and a search for truth that asks big questions about how we relate to each other as human beings in times of war and peace, no matter where we might hail from. In the role of his career thus far, Fox makes another eclectic but inspired choice, and in an age where masculine leading men are few and far between, with brains and brawn a distant second to vacuous good looks, we can only hope to see Fox headlining more films of such rare quality in the not too distant future. Timothy E. RAW talks to actor Matthew Fox for Cine Outsider about his lead role in Peter Webber's Emperor. This video has been optimised to be viewed full screen at 1080p, which can be selected from the YouTube control panel once the video is playing. Our sincere thanks to Teresa Kowalski at DDA PR for arranging this interview. Timothy E. RAW also interviewed Director Peter Webber for Vérité Magazine and this in-depth discussion is well worth a watch.